Here's something I hear often. "We floated the idea of an improved contact strategy by our vendor partners. They weren't excited about it". Of course your vendor partners think it's a bad idea to improve your contact strategy. Your contact strategy is the reason they are in business! Product vendors deserve to be paid, of course, or YOU aren't in business!! So they earn (in our example) $45 of every $100 you sell. 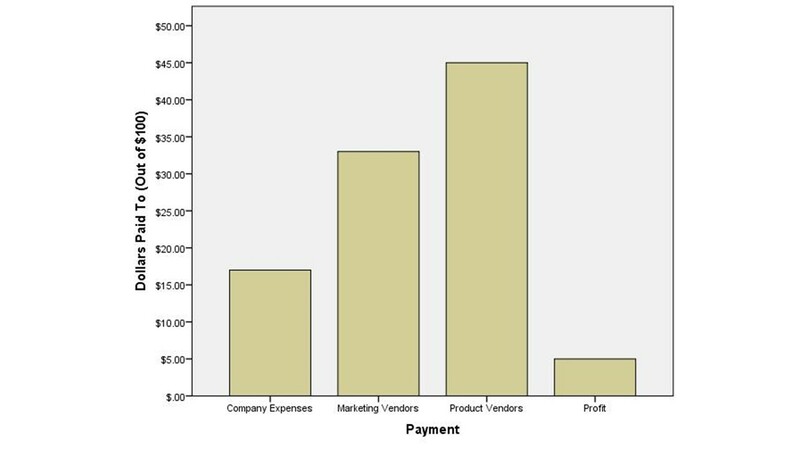 Marketing vendors need to EARN the right to be paid. When I worked at Nordstrom, we spent less than 2% of net sales on marketing. Let that sink in for a moment. Meanwhile, it is common for catalogers to spend more than 30% of sales on marketing ... in our case here, the fraction is 33%. And if you break the numbers down, you learn something interesting. $8 of every $100 sold are paid to your Paper Rep (your rates will vary). $8 of every $100 sold are paid to your Printer (your rates will vary). $8 of every $100 sold are paid to the USPS for Postage (your rates will vary). $6 of every $100 sold are paid to online marketers (Google + Facebook + Retargeters + Affiliates + Assorted Middlemen & Middlewomen). $2 of every $100 sold are paid to catalog co-ops and assorted catalog vendors. $1 or less of every $100 sold are paid to your email vendor. In our example, the cataloger earns a typical 5% pre-tax profit rate off of the operations of the business. Your paper rep makes more off of the operation of your business than you make. Your printer makes more off of the operation of your business than you make. The USPS makes more off of the operation of your business than you make. A myriad of assorted online marketers make more off of the operation of your business than you make. This is why your vendor partners dissuade catalogers from moving into the future. Significantly more money is made off of the operation of a catalog brand by vendors than by the catalog brand. When you read stuff like this (click here) and then you look at the breakdown of payments above, you begin to understand why your vendor partners think it is a bad idea to make catalog contact strategy changes that move you closer to the future. Tomorrow, I'll share some thoughts about what the catalog industry has become.